Posted November 25, 2015 by Coffin Ed and Miss Death and Jay Katz & filed under Arts & Entertainment, The Naked City. Given the vastness of the known universe, very few musicians across all genres have looked to the heavens for inspiration. There are of course notable exceptions––like the astral traveller himself Sun Ra, the galactic funk of George’s Clinton’s Mothership Connection and Gustav Holst’s classic ‘The Planets’ to name a minority that have made that journey. It’s not surprising that most musicians prefer to preoccupy themselves with more earthly themes, but given the current advances in space exploration, maybe it’s time they embraced the Cosmos as well. Kenya explained that she had been looking to make her music more interesting, using a found sound. It was when she eventually came across the website of astronomer Professor Paul Francis that the connection finally came. Francis had constructed a series of space sound MP3s drawn from NASA’s electromagnetic data. Kenya made contact with him and he was more than happy to have his material incorporated into a musical suite. 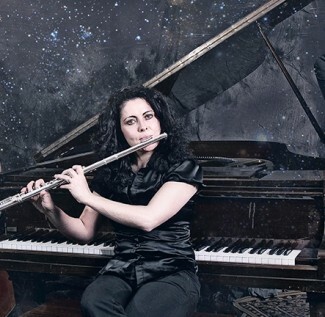 Together with Ellen Kirkwood on trumpet and Elsen Price on double bass and loop pedal, Kenya has formed the Ephemera Trio to produce a show that transports the audience through a universe of pulsars, craters, planetary atmospheres, stars, sun and void. The trio’s free flowing jazz, incorporating the soundtrack constructed by Professor Francis, is set against a backdrop of dazzling space projections. Kenya remembers that she has always enjoyed watching astronomy documentaries, especially when they include actual probe footage. Each member brings their own unique voice to the ensemble, drawing from a multitude of musical backgrounds. Elsen is a new music specialist, Ellen is a celebrated jazz trumpeter and composer, and Keyna herself is a jazz/classical/flamenco musician and composer. Fasten your seatbelt as Ephemera Trio take you on an adventure in space and time.